At the Writing Center, we often talk about the flow in writing. While it’s a small word, flow incorporates many parts of writing, which can make it difficult to define and complicated to achieve. 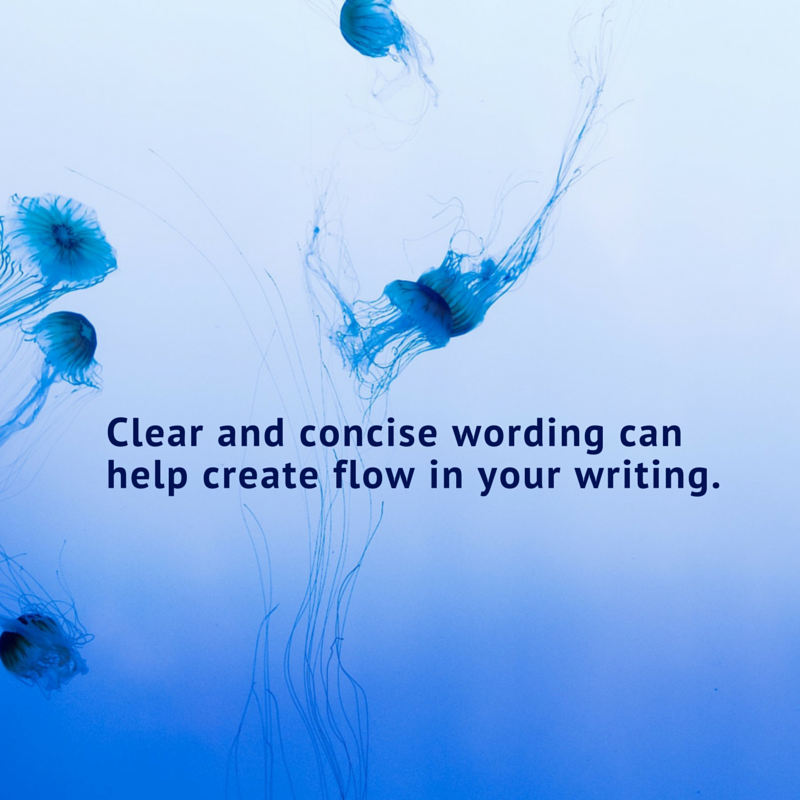 Creating flow involves using logical connections between ideas, strong topic sentences to start paragraphs, transitions to link sentences, concise wording, and a varied sentence structure. One commonality between these parts of writing is that they make the reader’s job easier. And, that’s essentially what flow is: Techniques and characteristics of good writing that make the writing easy for the reader to navigate and understand. 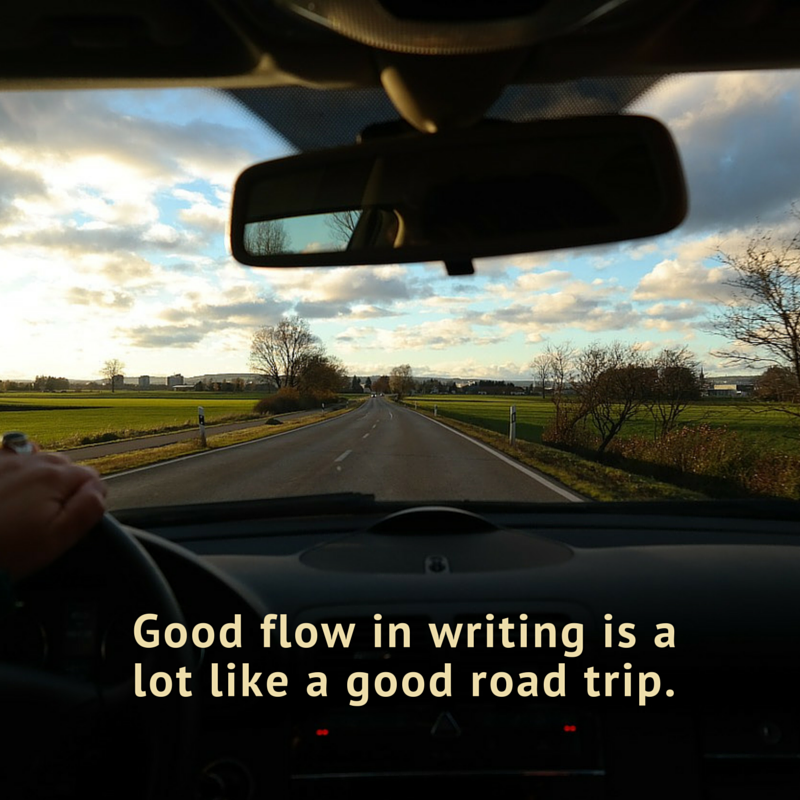 In this way, good flow is a lot like a good road trip. If I was writing a paper about the advantages of online education, I might first discuss how online education can be useful to people who are working adults, as well as people who live in rural areas. But what if I then talked about how students are more engaged when they live on campus? This last idea doesn’t fit with my other two ideas, so my reader will have to pause and try to understand the connection, thus interrupting the flow. This idea that doesn’t fit is like road construction. Both the unconnected idea and the construction impede progress, and the reader, like a driver, must take extra time and effort to try to figure out a way to get around the construction. 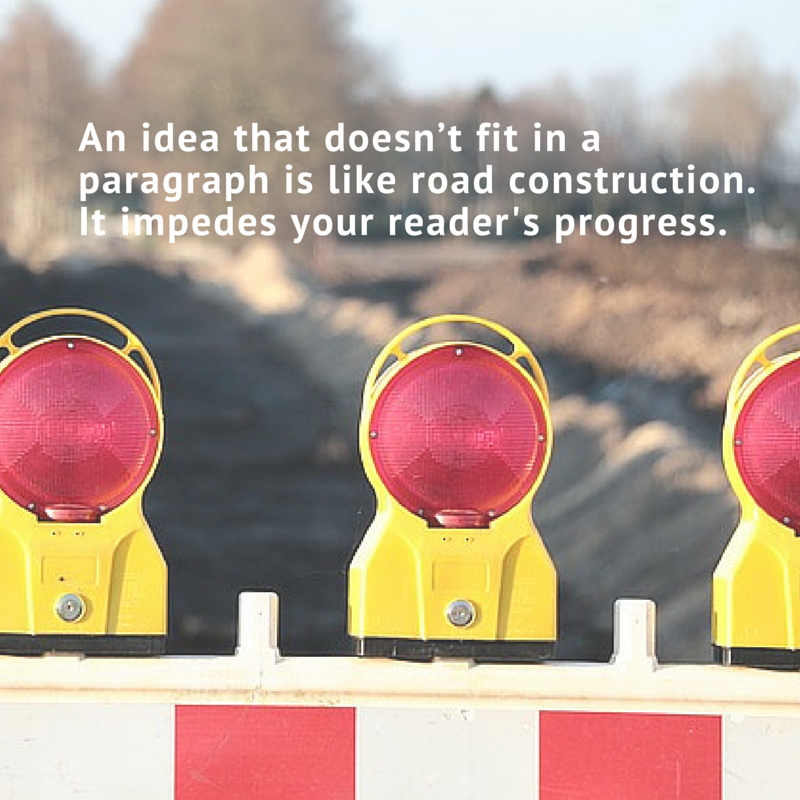 But, remove the road block—the idea that doesn’t fit—and driver/reader has smooth sailing. In academic writing, topic sentences are the first sentences of a paragraph that tell the reader the focus of the paragraph. See how I used a topic sentence for this paragraph? My first sentence clearly told you, as the reader, that I was going to discuss topic sentences in this paragraph. 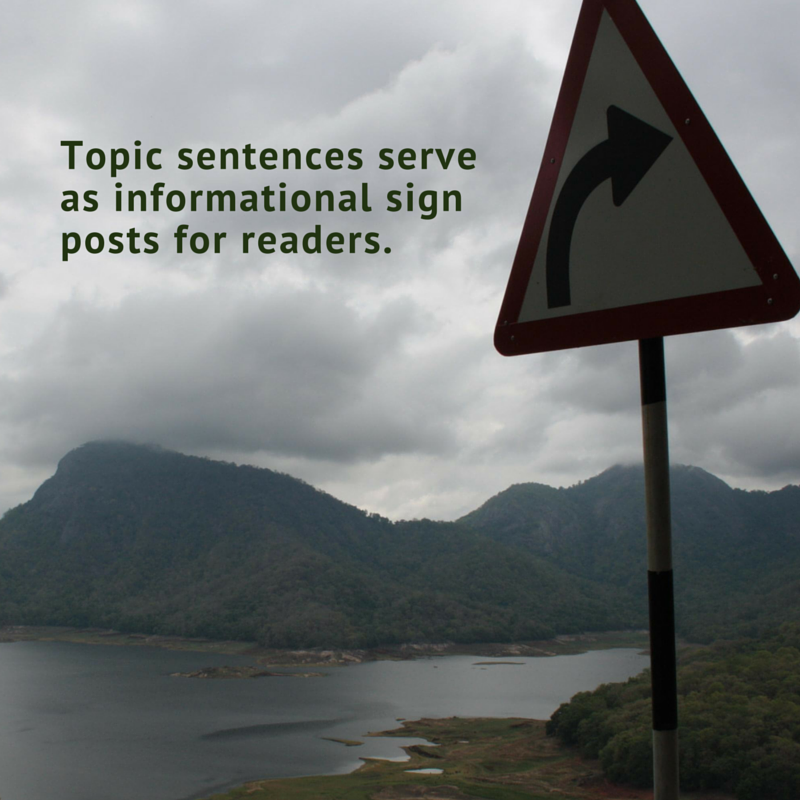 Topic sentences act as informational sign posts so readers can anticipate what’s coming up ahead. Transitions create flow by linking ideas and sentences. Writers can create transitions in a couple of ways: (1) using words like additionally or however to begin sentences and (2) repeating key terms or phrases between sentences. Transitions are like bridges between roads. 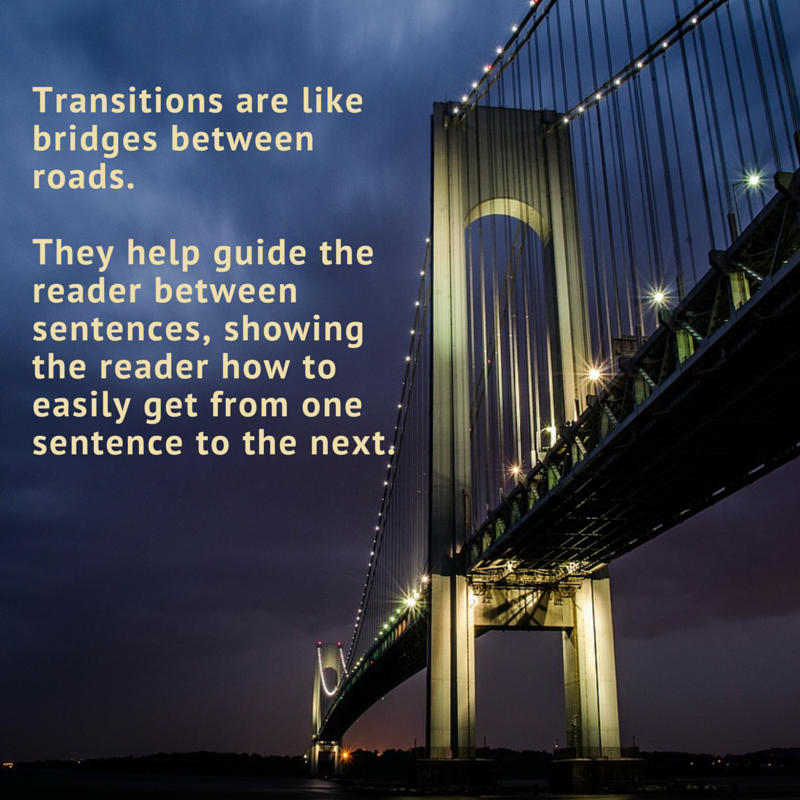 They help guide the reader between sentences, showing the reader how to easily get from one sentence to the next, just like a bridge can bring you from one side of the road to the other safely and easily. Clear and concise wording also creates flow. Take this sentence: Online education, which means education in an online format where you are not face-to-face with your teacher or classmates, can help a student become more proficient in their area of expertise or field, which in turn can also help a student show leadership skills and receive a promotion or recognition for his/her good work at their job. Whew, that’s a long one. Note all the phrases and ideas stacked on top of one another that the reader must navigate. Instead, I could have easily said: Online education helps students become proficient in their field, which can result in recognition for students in the form of a promotion. Much clearer! This sentence has the same meaning as my previous sentence, but is more concise and easier to follow. Using concise and precise wording is like creating a direct route in a road trip. Instead of taking your reader through all the winding back roads and causing car sickness, you’re taking the reader on the most direct route to your ideas. Avoiding repetition creates flow by getting readers interested in your ideas and in the way you talk about your ideas. Think taking a long road trip through flat, rural countryside. Without variety in scenery, the drive can become boring pretty quickly. 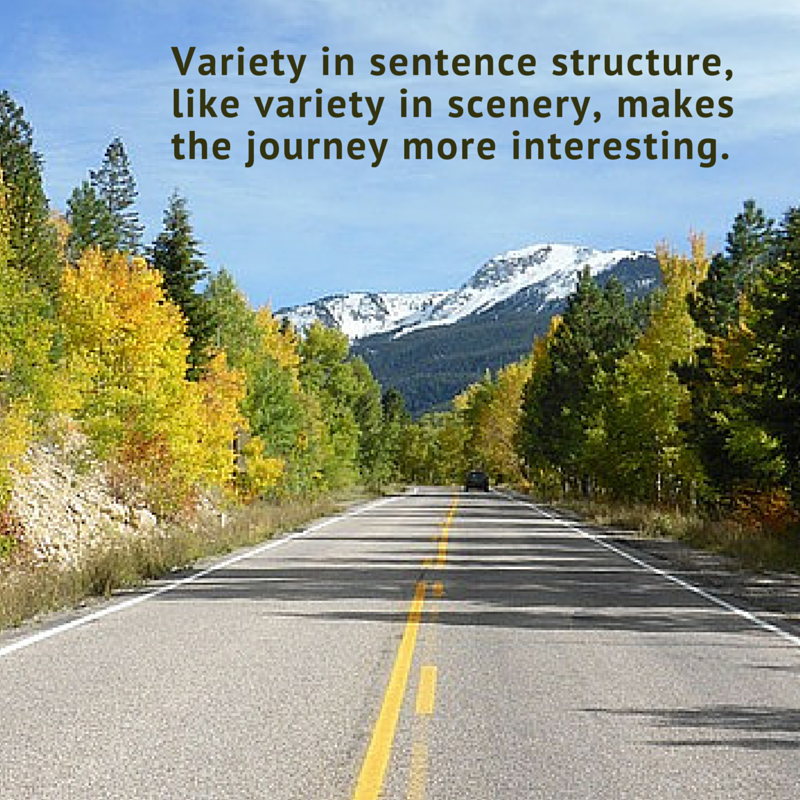 Variety in scenery—like variety in sentence structure—makes the journey more interesting. Take these sentences, for example: Online education is beneficial for many students. Online education benefits many students in rural areas. Online education benefits many students working full-time jobs. My sentence structure is the same in each sentence (a simple subject + verb construction), and I repeat the words online education, benefit, and many students. Here’s another version that varies the sentence structure and wording, and thus is more engaging: Online education is beneficial for many students. In particular, students in rural areas and those working full-time jobs can find online education convenient and useful. As you write, remember to use logical connections; topic sentences; transitions; clear, concise writing; and varied wording and sentence structure. If you can master these aspects, then you’re on your way to creating flow in your writing! Editor's Note: In 2016, we expanded Beth's discussion of flow in academic writing. Our Instructors and Editors expanded on each one of these strategies in a full-length blog post. So, if you'd like more insight and instruction on any of these five categories, check out our Writing Center Greatest Hits Update: 5 Flow. Follow this link to access the expanded, in-depth discussion on increasing your writing's flow today! 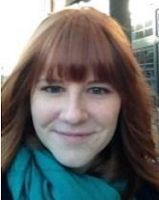 Writing Instructor and Coordinator of Webinar Writing Instruction Beth Oyler writes about literature in her spare time and enjoys contemplating the possibilities writing creates. I just got this email from you. I will read this info concerning flow. I am on the 60 version and frankly almost about to give up. I just want this prospectus to go through and I have never in years of paper writing ever been through all of this. I appreciate your insight but I would like, as I am running out of funds, to finalize this prospectus and get on with the literature review. Thank you for corresponding with me so that I can achieve that. I have been on the prospectus so long that a middle school student had gone to high school, college, and headed to medical school. How is the best way to write a Background Literature? write what lit says about the topic, or what researches that had used the intervention being proposed did? We hope you will give these tips a try, Ayatollah. Let us know how it goes! I like how you gave examples and pictures. Wonderful! Thanks for reading and for your comments. This article is creative and helpful. Thanks! Hi there! Thanks so much for your comment. :) You can find a few examples of successful prospectus documents here (http://academicguides.waldenu.edu/doctoralcapstoneresources/phdpppa/prospectus). You're right that the Writing Center does not review prospectus or dissertation documents; however, there are a number of resources available to students at this stage in their program! See this page (http://academicanswers.waldenu.edu/faq/73271) to learn about these resources. You are so welcome, Jane. I'm so glad to hear that this was helpful. Thank YOU for your kind note. :) Have a great week! Any idea to write summarize from passages ? Mostly, it's not logical (that what my native speaker friend told me). You might also want to review the information on paraphrasing linked on the sidebar of that page! Thank you, Robin! We are glad you find our blog useful! Ah! This was definitely needed. It is also a major part of my Best LSAT Prep Course and I am grateful to you for sharing this post. I will learn it so that I am able to write good essays and paragraphs and so that I am able to finish my assignments on time as well. We're glad our blog post was helpful for you, Gregor Renk! What's the Problem With Passive Voice?